· 51 percent of units are owner-occupied or second homes. · No single entity owns more than 10 percent. · No construction defect litigation and all other litigation will be reviewed. · Reserves must be funded to at least 10 percent of the annual budget. · No more than 15 percent of association dues are delinquent more than 30 days. · Condominium rentals are not advertised as daily rentals, with a minimum three-day rental period. Right of first refusal cannot be present in condominium documents (no discriminatory conduct). No more than 15 percent of units may be in arrears more than 60 days. 50 percent of the project must be owner-occupied, which includes primary residences and second homes. At least 10 percent of the budget must go towards reserve funding. No pending litigation, not including collection activity or foreclosures. Insurance coverage must be 100 percent replacement cost of the condominium, not including the foundation and land. Flood insurance is required if within the 100-year flood plain. Fidelity bonds are required for complexes of 20 or more units for those employees that handle funds. The amount of fidelity coverage must equal three months aggregate assessments plus reserves. Still, here in 2014, there are many condo owners who are upside down on their loans, meaning they owe more than 100 percent of the current value of the current appraised value. To address this issue, which affects millions of home owners in the United States, not only the condo market, but in the primary residential housing market as well, Congress passed the Home Affordable Refinance Program (HARP) in 2009. This was supposed to provide lower cost financing to assist owners in lowering their mortgage payments to more acceptable and tolerable levels. However, it did very little to assist distressed owners, especially in the condo market. As a result, in 2012, HARP 2.0 was introduced by the White House with significant input by Fannie Mae and Freddie Mac. HARP 2.0 dramatically increased the amount the home owners could be under water. With that change, many home owners, as well as condo owners who were not eligible, will now qualify. HARP 2.0 allows for primary residences, second homes and investment properties. For primary residences and second homes, the loan to value ratios can be made up to 200 percent. However, investment properties loan to value ratios are only allowed up to 135 percent. A limitation on HARP 2.0 is that many lenders will not make these loans if the condos are labeled as “condotels” (effectively a hotel) by HUD. As pointed out in my previous article, HUD, does not allow for on-site rentals and minimum rental period of less than three days. In addition, agencies or their representatives are now making a practice of going online to confirm that associations and rental management companies that extensively rent in condo buildings are not advertising on their website that daily rentals are available. In fact, some have gone as far as to call condominiums pretending to be interested in rentals to see if they can obtain rental stays less than three days. Another limitation is that only those with current Fannie Mae and Freddie Mac loans that were made before May 31, 2009, qualify. 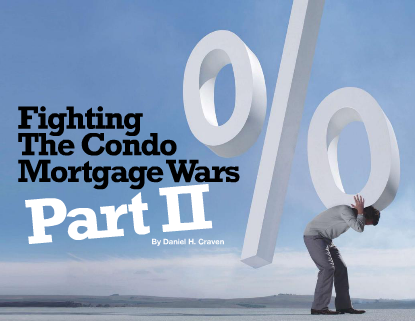 In conclusion, condominium associations are still fighting the mortgage wars in 2014, although many condominium associations are in better position at this time to meet Fannie Mae, Freddie Mac, FHA and HUD requirements. HARP 2.0 may provide some relief to selective condo owners that are under water. It remains to be seen, however, as to how much impact it will really have. 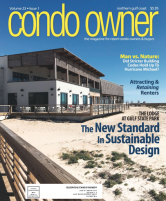 The percentage of condo owners in delinquency on association dues, as well as condominium association foreclosures, have dramatically dropped since 2011 and are, in our area, down about 50 percent. Part of this is because many of the troubled units have been foreclosed on and flushed through the system. Another part of it is due to improvements in the economy and the rental market in our area, which has allowed many owners to “catch-up” and improve their financial standing. There remains, however, a significantly large group of condo owners “under water,” and it is my hope that we continue to see improvement in the rental market, and improvement in the overall economy and that programs such as HARP 2.0, will assist our condo market in restoring itself to pre-Hurricane Ivan performance.